Our prank war with the Robonauts has been happening on and off since 2009. During the 2018 season, the Robowranglers successfully completed “Operation Blackout” and I did a writeup about it, and the history of the prank war so far. 2018 Championship: Operation Blackout. They are some of our closest friends, and fiercest opponents. Each team has adopted former students from the other as mentors. We've traveled together. We've played together. We've fought each other. What is the defining archetype of our relationship? This year, we did a bit of a sneak attack. Who expects to get pranked from afar? Of course, in order to really appreciate Drivethru, you need to watch the Side x Side remix Drivethru x Flyby. For a few years now, we’ve talked about all the fun we could have if we built a “white” version of our robot. (The “copy their video” prank is actually one of the more mild ones, trust me) This year, we decided to make it happen. During the final design review (before we started releasing parts for manufacturing) we discussed how “this feels more like a Robonaut robot than a Robowrangler robot” - a sentiment the FRC community seems to share. Drivethru is functionally identical to our “real” robot Overhang in every way. We didn’t build a new robot. Since 2007 we’ve built more than one robot during the build season - many teams do this so they have a practice robot. Since 2016, we’ve built (3) robots. I talk about the reasons for this in my 2018: Day 28 Update. If we’re building three robots anyway, how hard is it to make one of them “Robonaut Themed”? We didn’t change the design at all. We made cosmetic changes. The only “functional” thing we changed involved swapping the drive wheels from traction to omni-directional for the video shoot to enable “drift mode” (and allow for those “fishing line, smoke and mirrors” sideways driving shots). Our plan was to do this regardless of what 118’s robot actually looked like (there would just have been more smoke and mirrors in the video, if 118 had big functions we couldn’t emulate). We don’t powdercoat every sheet-metal piece we get. Most of our sheet-metal stays “silver” for the season. We simply took a set of the un-coated ones and asked a paint-shop to give us some white and gold versions. 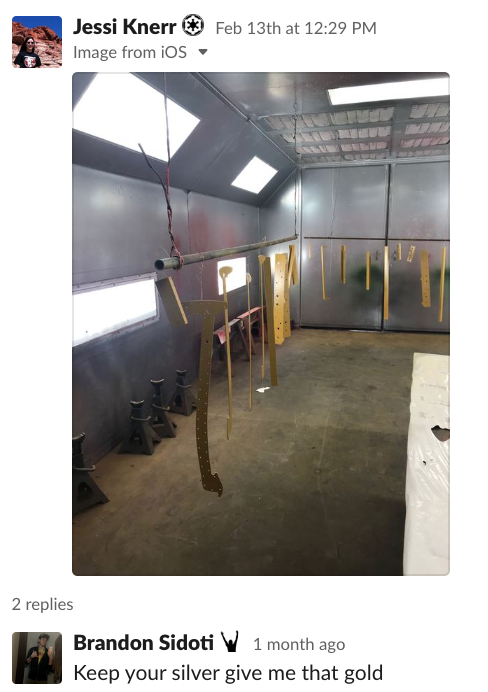 Fun Fact: We color matched the “Robonaut Gold” by giving the paint-shop some of the gold mustaches left over from their 2013 prank! Each year, we place a bulk order for Black Lexan from our plastic supplier. We love the way the black lexan makes our robots look. The #AllBlackEverything has gone to another level since we started using it. This year, we just bought a few white-sheets along with our black sheets. The white lexan looks sooooo good. Like… disconcertingly good. Seductively good. I won’t lie, there were times during build where we talked about a brand change for 2020. This is probably my favorite part of the whole thing. Will the Robonauts switch to white lexan in the future? If they do… we’ll all have Drivethru to thank! Our design team DID spend some extra time placing “Robonaut” lightening patterns and logos on the 148 parts. They seemed to love this, and were happy to put in the extra effort. In fact, we had all kinds of people put in extra-effort without complaint. Once you tell someone the backstory, they’re excited to be a part of it. Going back to my Prank Guidelines: you can get away with almost anything, if it’s funny enough. People are willing to go above-and-beyond if they get to be part of the right “wow” moment. Dillon Row (one of our mentors) still talks (fondly) about spending hours and hours and hours writing “Robonauts” on playpen balls as a student. There are a few people in the FRC community talking about the resources we “wasted” doing this. From my perspective: all it took was a little paint, a few thank-you gifts to our vendors, a little time, and a little planning. Like with almost everything… the commitment to making it happen was the limiting factor. We’ve been working on this project since early February - long before we knew anything about Flyby, long before we knew what Overhang would be called. As such, it’s had a few names. (Some of my favorites are RoboNOT, and Goldie.) We also developed a whole brand for it, as the “mirror” to Overhang… “Cantilever”! I still like “Cantilever”… the problem was, once we saw Flyby’s unveiling, and once someone said the name “Drivethru” we were hooked. The Robonauts always have that shot where the previous years’ robot passes the game object to the new robot. Of course, we wanted Uppercut to participate! Don’t worry… we didn’t paint the champ. This is Uppercut’s practice robot (or at least what’s left of it). It got a nice gold-foil finish, and some white duct-tape bumpers. See, that’s what people don’t understand. We don’t have a subteam working on stuff like this - we have our entire team. The prank war builds morale. It motivates people. It turns out: wranglers will do ridiculous things to chase excellence, especially if that particular form of excellence is funny enough. This kind of stuff is ingrained in our culture. Culture is a strange thing, an unstable mixture: it’s hard to understand what pieces of culture are important and which aren’t. I suspect if we stopped doing things like Operation Movie Magic, we wouldn’t be the same Robowranglers. When people email me asking for help “performing like 148”, maybe I should tell them to start a prank war? (Don’t start it with us though, find someone else… we’ve already got a playmate). I love the fact that we did this. The team had a lot of fun working on it, and we’re enjoying the reaction from the community. Our relationship with the Robonauts has always been special, and things like “Operation Movie Magic” are a big reason why. I can’t wait to see how they’ll respond.